With the festive season right around the corner, we’ve been busy making Hike even better. Check out what’s new for September. Now you can receive and add partial quantities in Hike. Hike will mark the partial quantity as received and add to your inventory. You can update the remainder of the quantity later once it is received. Hike will keep track and log the inventory change for each update entry. 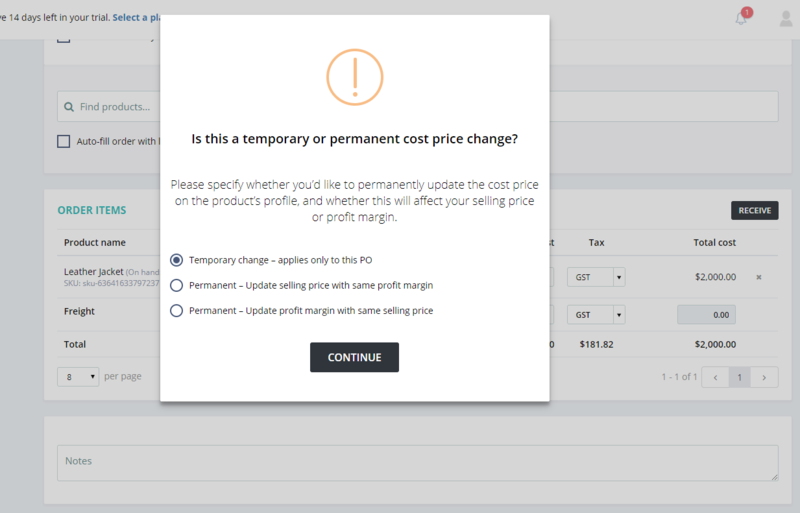 If you change the product cost price at the time of creating a new purchase order, Hike will ask you if you’d like to permanently change the purchase cost price for the product. If so, the new item cost will be automatically updated on its profile page. With just one click, you will also be able to define whether the updated selling price is in line with the new cost and profit margin, or whether you’d like to keep the selling price unchanged and simply only adjust the margin. Mistakenly added wrong quantity in items received for a PO? Not a problem. Now you can edit received quantity anytime, even when a purchase order is not yet marked as complete. If you are no longer going to receive the remainder of the ordered item, no need to update the ordered quantity in your purchase orders. Simply mark it as complete and Hike will remove the remainder of the quantity from the ‘awaiting’ list. If you integrate with Xero or QuickBooks Online, Hike will send only the received quantity to your accounting software. Enhanced product search feature in your purchase order makes it faster than ever to add items to your PO. It is further enhanced with supplier item code included in your purchase order line items. In our September updates, the Hike POS iPad App now supports Epson printers, the TM-T81 and TM-T88. Both thermal receipt printers are regarded for their brilliant performance for retailers around the world, and we’re excited to have them available for our customers. Some minor bug fixes and speed improvements have also been applied to this release.